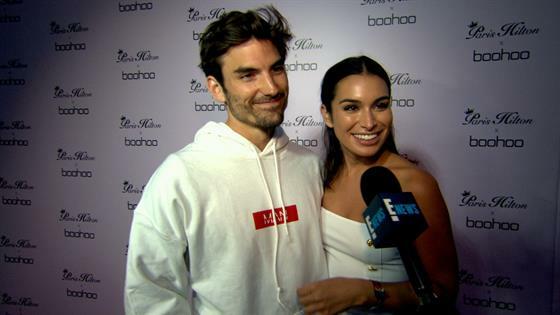 Ashley Iaconetti is the first to admit she's had to kiss a few frogs before finding her Prince Charming. The Bachelor in Paradise star recently got engaged to Jared Haibon, the fairy tale ending to one of the most dramatic courtships in the franchise's history. For those who haven't kept up over the years, Ashley fell for Jared on season 2 of BiP. The feelings weren't recipocrated, and the pair settled for a best friendship. It wasn't until Ashley struck up a romance with Kevin Wendt on Bachelor Winter Games that Jared realized she was the one for him, and after professing his love they finally started dating earlier this year. Fast forward to last Sunday, when Jared popped the question in Mexico. The proposal will be featured on the upcoming fifth season of Bachelor in Paradise, but E! News caught up with the future bride and groom to talk all things romance at the Paris Hilton x Boohoo Launch Party in Los Angeles. Jared gushed, "As of right now, we just got engaged, we're fiancées, we're madly in love and enjoying life." Ashley told us she's completely overwhelmed by the positive response to their engagement, sharing, "It is the sweetest, coolest thing to hear people say that we inspire and give them hope for the love in the future. A lot of the girls who watch me and us on this journey have always been in my position... Perpetually single, the guy they want never wants them back." So what's the reality TV star's message to fellow hopeless romantics? "The wait will be worth it!" Ashley continued, "We kind of have the relatable Bachelor love story because it started out as friends. I think almost 70 percent of couples do start out as friends… It took three years to get to this very wonderful, happy place." Jared and Ashley, you give us hope! To hear more from the lovebirds, including their advice to current Bachelorette Rebecca Kufrin, press play on the video above!